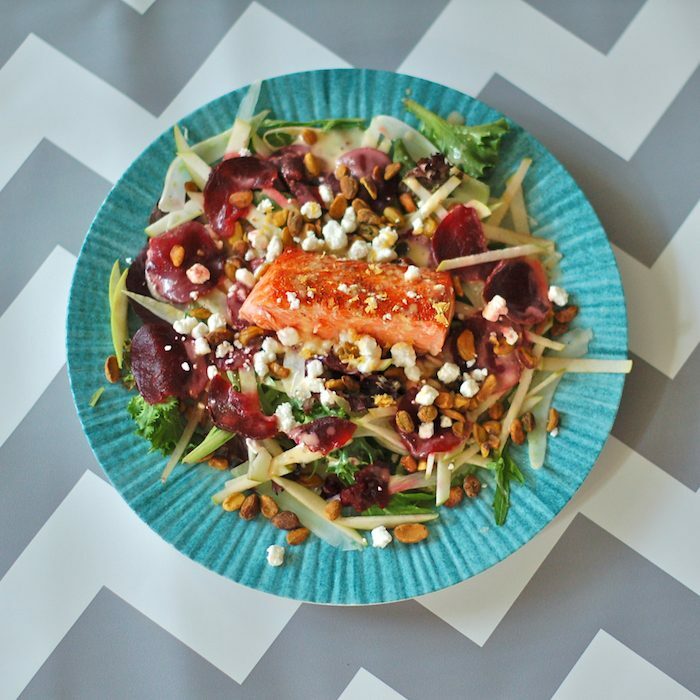 This Salmon Waldorf Salad is brimming with nutritious and delicious ingredients including fennel, beets, and apples, all tossed with a citrus yogurt vinaigrette. Enjoy for a satiating, heart-healthy lunch or dinner! This page also contains affiliate links. See below for full disclosure statement. Guess what time it is?! Recipe ReDux time! It’s hard to believe that The Recipe ReDux has been around for four and a half years and I have been a participant from the very beginning. I look forward to the 21st and 22nd of every month (ReDux posting dates) to see what recipes my colleagues and fellow healthy bloggers share. Because the monthly theme is usually a specific topic (like National Nut Day, for which I shared Apple Peanut Butter Pancakes, or Fresh From the Garden, when I shared my Greek Zucchini Pie), there’s often some overlap in recipe concepts and ingredients that are used, but this month’s theme has me super excited to see what everyone was cooking. You may recognize this theme from last December, when I shared my Moroccan Spiced Lamb Burgers, but it was such a popular theme the ReDux founders (Deanna, Serena, and Regan) decided to bring it back. I can’t wait to see what cookbooks everyone’s cooking from and the recipes they chose to ReDux. I have many cookbooks on my kitchen bookshelf, but I honestly don’t cook from them very often. I love looking through them for inspiration and an occasional new recipe to try (just like I do with recipes I find on Pinterest), but for the most part I come up with my menu plan based on the ingredients I have on hand, what’s in season, and what I’m working on for recipe development for a client or to share on the blog. For this ReDux I looked at pages 54 and 154 in a handful of cookbooks I had on my shelf, but I didn’t find anything that intrigued me to ReDux (not to mention that many of my cookbooks are on the healthier side, so there’s not that much to improve on from a nutritional standpoint). In the end, like last year, I ended up choosing a recipe from the Food & Wine Annual Cookbook 2010, which is one of my favorite cookbooks (although I think it’s time I get a more updated copy, lol!). Page 54 landed me in the salad chapter, which at first thought doesn’t seem like the best section from which to ReDux a recipe. But I found the perfect recipe staring right at me – Waldorf Chicken Salad. Believe it or not, I don’t think I have ever had a Waldorf salad – it just never really appealed to me. I’m not big on mayonnaise-based salads, I never ate chicken salad growing up because we kept kosher and didn’t eat non-kosher meat out of the house, the combination of dairy and meat was also a problem for kosher reasons, and celery isn’t my most favorite vegetable, especially raw in salads. All that said, I know Waldorf salads are super popular among the ladies-who-lunch crowd, so when I saw this recipe I had to make a version that I would enjoy – and one that could be served to ladies who lunch. End result: this Salmon Waldorf Salad. Success! The main changes I made to the original recipe for this Salmon Waldorf Salad included using salmon instead of chicken, which not only allowed me to keep the cheese as part of the salad, but also added a hefty dose of heart-healthy omega 3s. 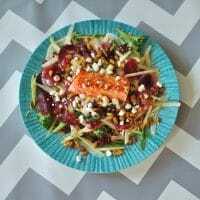 I also bulked up the salad with seasonal vegetables including beets and fennel, and kept the dressing creamy but on the lighter side by using a combination of low-fat yogurt and grapefruit juice. I also swapped walnuts for pistachios in this version. Trust me when I tell you this is a salad you will want to eat on repeat. It has so many flavors and textures and something for everyone. Whether you enjoy it for a heartier lunch or a lighter dinner, I hope you give it a try soon! 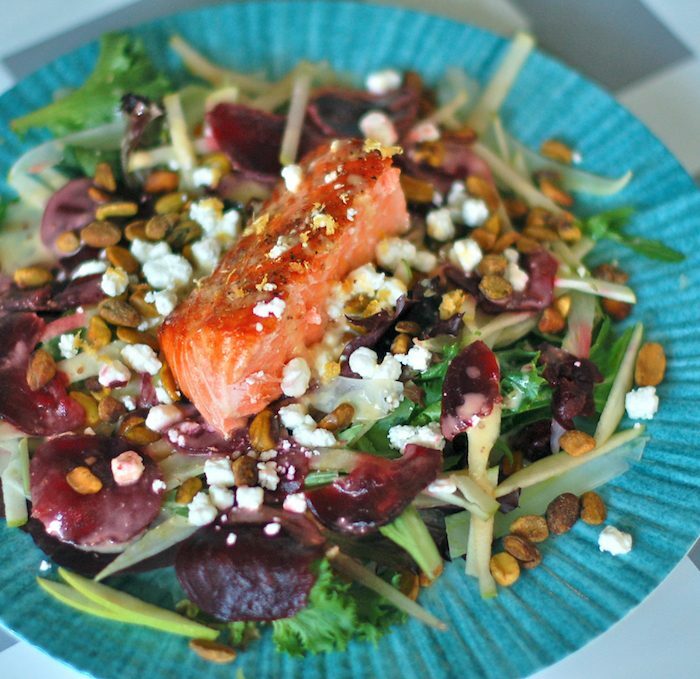 Mixed greens, ruby red beets, crisp fennel and green apple, crunchy pistachios, creamy goat cheese, and heart-healthy salmon are tossed with a citrus yogurt vinaigrette in this twist on the classic Waldorf salad. To make the dressing, combine yogurt, grapefruit juice, garlic, mustard, lemon zest, and lemon juice in a small food processor or blender. Blend until combined. Add 1/4 cup oil and blend again until emulsified. Season with salt and pepper and set aside. Preheat broiler at 450 degrees F. Place salmon fillet on a foil-lined baking sheet and sprinkle with 1/8 teaspoon salt and pepper to taste. Broil 15 minutes until cooked through. While salmon is cooking, toast pistachios in a dry skillet or toaster oven, about 4 minutes. To assemble the salad, divide greens, fennel, apples, beets, and goat cheese among 4 plates. Top with 1/4 of the broiled salmon and 2 to 3 tablespoons dressing. Garnish with additional lemon zest if desired. This recipe is for 4 entree salads, but it can also be served as a side salad or appetizer for more people. Have you ever had a salmon waldorf salad? Disclosure: This page contains affiliate links. If you purchase products through these links, your cost will be the same but I will receive a small commission to help with operating costs of this blog. As always, all thoughts and opinions are my own and I only recommend products I truly believe in. Waldorf Salad is one of my favorites but I never would have thought to try salmon for the protein. Smart! Looks delicious too! Oh, i hope you try it Marisa! If you like salmon I am sure you will love it! It’s amazing how the internet and social media have changed the culinary landscape! I used to dislike fennel, but now I love it. Hope you give this salad a try! ooh, celery in tuna salad is good. Forgot about that combo! Glad I’m not alone in not loving Waldorf salads – I always assumed I was alone with that! Thanks Deanna! You know how much I value my membership to the ReDux and how grateful I am to you ladies for starting this fabulous group! Hope you love the salad as much as I did – will be a great way to start the New Year! This salad looks delicious! I love all of the beautiful colors and textures! Thanks so much Amber! There’s definitely a lot going on, but that’s what I love about it! You know, I don’t think I’ve ever really had a traditional Waldorf salad. It never really appealed to me either, but you probably know by now that I love salmon, so this makeover is right up my alley! It looks so pretty and flavorful 🙂 I love this redux theme, it’s so much fun! Glad to know I’m in good company, Sonali! Can’t wait to hear what you think after you try it! I agree – this theme is so much fun! Totally agree with you Jessica on the mayo-(typical) Waldorf salad. Your version sounds much more appetizing! Thanks so much Mary! Hope you try it out! Such a great combo this salad has everything I love and is packed with flavor and texture! Thanks Sarah! It’s one of my faves too! Thanks Abby! Hope this satisfies all your taste buds! This looks delicious! I love salmon on my salads! Thanks Carrie. 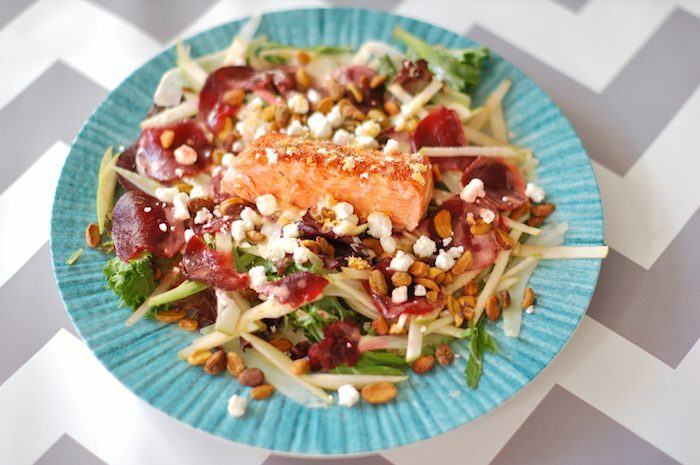 Hope you give this salmon waldorf salad a try soon! Salmon is my favorite fish. I never tried making salmon salad so this is going on my to try list asap. Looks absolutely delicious. Flavorful. Woohoo! Can’t wait for you to make this then. I hope you love it! I’ve never had a Waldorf salad either — and I have to wonder if it’s because my parents both kept kosher when they were growing up. We didn’t when I was a kid but I’ve still never had a cheeseburger (with no plans to, to be honest)! That’s so funny! Now I’m curious too!!! It’s funny – with all the dairy-free cheese subs and yogurts one would think I would have had a cheeseburger or chicken salad by now, but it’s just never appealed to me! Thanks Deborah! Would love to know if the kids end up trying it! This looks sooo good and pistachios are one of my favorite nuts, especially in a salad. I also love that you used salmon instead of chicken. Very yummy! Thanks Summer! Hope you give it a try soon. this is such a refreshing salad! It sure is! Thanks Dixya! Thanks Farrah! It’s hard to remember cookbooks sometimes when online recipe sources are at our fingertips! I only have one salmon filet and no fennel. If only it was a few months later I could go grab some from the garden. Waldorf salad was something my mom always made for Easter and other times though the year. Loving your twist! Oh, well who’s going to be the lucky salmon dinner winner?! Hope you enjoy this twist and it brings back some memories of your mom’s version!